JQL stands for Jira Query Language and is the most powerful and flexible way to search for your issues in Jira. JQL is for everyone: developers, testers, agile project managers, and business users. This blog is intended to be a tutorial for those who have no experience with database queries to those who want faster access to information in Jira. So basically if you work in Jira this blog is for you. Searching in Jira: how do I start? The most simple search feature in Jira is the search box at the top right of your screen. You can also search issues from the “Issues” section in the dropdown menu. You can filter on any field available in Jira (depending on the selected project(s)). There are two types of searches in Jira: basic and advanced. Basic searches, like the ones above, present you with a set of forms that you can fill in, such as Project name, Issue Type, Status, and Assignee. Basic search can be useful for getting a high-level view of your issues and status. Now Advanced Searching is where you will get into JQL, using it to form queries. Queries are a series of simple elements strung together to form a more complex question. A query has three basic parts: fields, operators, and values. Field – Fields are different types of information in the system. Jira fields include priority, fixVersion, issue type, etc. Operator – Operators are the heart of the query. They relate the field to the value. Common operators include equals (=), not equals (!=), less than (<), etc. Value – Values are the actual data in the query. They are usually the item for which we are looking. Keyword – Keywords are specific words in the language that have special meaning. In this post we will be focused on AND and OR. project = Collaboration AND status = "In Progress"
Returns all issues from either the Collaboration project or that have their status set to "In Progress". project = Collaboration OR status = "In Progress"
This will return all issues that have no description. status = "To Do" OR status = "In Progress" OR status = "Closed"
What issues are blocking or critical in Projects A, B, and C? The “in” keyword will include any item that matches any item in the list. In the above example it will return all of the blocker and critical bugs in projects A, B, and C.
This is extremely helpful for organizations that have service level agreements (SLA) with their customer base. A JQL query can easily find the issues that are not meeting that SLA. What issues are unassigned and have not been updated in the last day? In this query the “is empty” statement only includes issues where the value of the assignee field is blank. This query also shows how Jira supports relative dates. The value -1d evaluates to 1 day behind the current date when the query is run. As a result, the above query will return all issues that do not have an assignee that are at least one day old. Don’t be intimidated by Jira’s Advanced Searching! 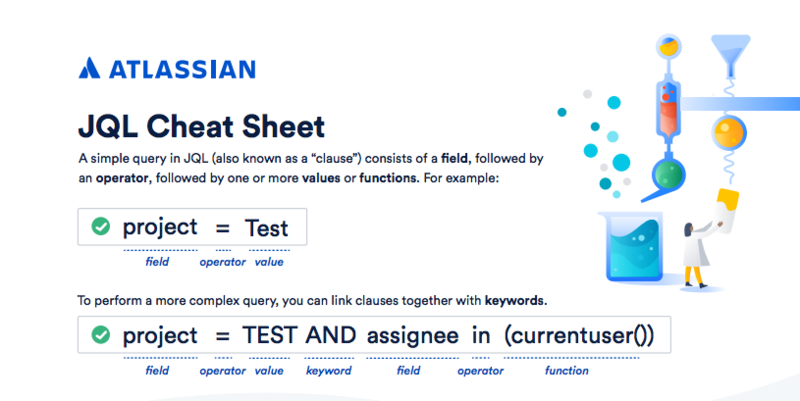 Jira’s JQL editor makes it easy to learn JQL. The editor uses code that hints as you type. For example, if we want to type the following JQL: project = Pipeline, Jira gives suggestions at each step of the way for each of the three components of our query. Click on “Syntax help” anytime if you get stuck. Maarten Cautreels, AUG Leader and Community Champion, also contributed his expert advice to this post. Thank you, Maarten! You can read Maarten’s articles and ask him questions on Atlassian Community. And, to get even more JQL training, check out our tutorial videos. We also have a downloadable cheat sheet to keep close on hand as you perform searches with JQL. Copy and paste fields, operators and functions into the Jira search bar, as well as learn more advanced queries.